We will be using only odorless solvents, but allergics take note, it is oil paint and Turpenoid is a solvent although odorless. 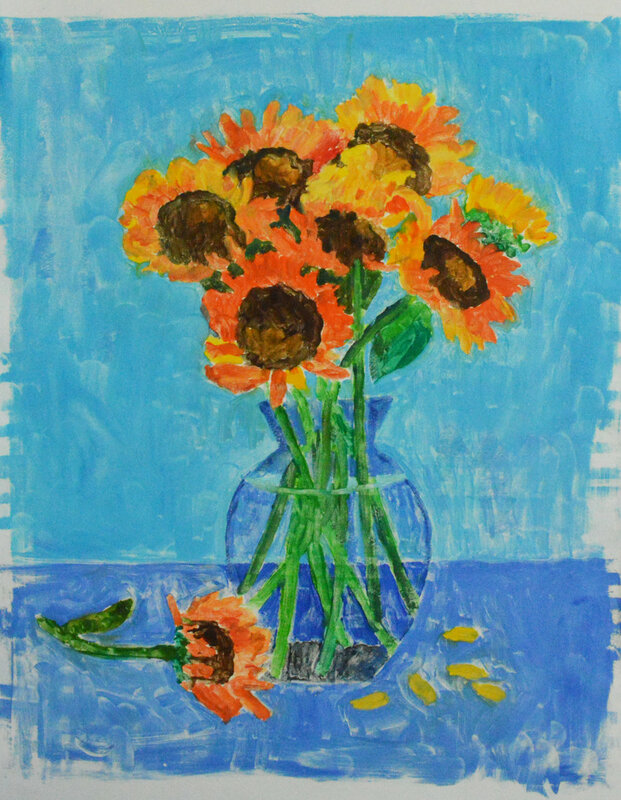 If you have never done monotypes, you will love the spontaneity of this printmaking process. It can be so very basic and simple, or more complex, to satisfy the tastes of all artists. It will even be exciting for people who have never done any art at all! Gainor will provide instruction and tools for making monotypes without a press. A monotype is produced by painting on a non-porous plate (in this case an acrylic plastic sheet) and then transferring the image to paper. Usually the process produces only one print, thus the term “mono” “type” or one print. Many monotype artists prefer to use BFK Rives wet etching paper but doing monotypes on a variety of exotic printmaking papers is really fun, although not as reliable as printing on etching paper. There will be an assortment of papers to choose from. There will be a short demonstration of the process to start, and then you are invited to paint your panel using your imagination, photographs, or live objects, using oil paint. You might want to do a small panel first to get the hang of how much paint to apply and how to print it. Then you can graduate to a bigger panel to try out some other papers. Ideas for your work, from photos or still life or your imagination. Photos or drawings may be enlarged by computer or by hand and placed under a clear acrylic panel. This will save a lot of time if your subject is at all complicated! Something to drink and a bag lunch to eat. $50 for members, $65 for non members. There will be a $10 materials fee due the day of the workshop. if you are familiar with the process and want to bring your own oil paint, brushes, palette and papers we will waive the materials fee. Click the title below or email Patti Kenney to register for this workshop. Drawing and Painting fascinated me since early childhood. My great-great aunt, Ellen Wetherald Ahrens, was a gifted artist and a student of Howard Pyle and Thomas Eakins, in Philadelphia. I like to think I might have some genetic claim to my art desires. In any case I was introduced to great art at an early age and was more comfortable expressing myself with paint and crayons than talking. My formal education in art began the summer of 1959, the year I graduated from Germantown Friends School, in Philadelphia, the city of my birth. That summer I began to study with Robert Brackman, world renowned portrait and figure painter, who lived in Noank, Connecticut, a tiny fishing village near Mystic where my parents had a summer cottage. Mr. Brackman has been a significant influence on my work and his teachings have inspired me continuously for more than 50 years. I continued to study with Brackman at his schools in Noank, and later in Madison, Connecticut during the summers, while I attended Elmira College in the winter. After graduation with a bachelor’s degree in English I went off to New York to study painting at the Art Students’ League. At various times through the last 4 decades I owned a silk-screen business, typesetting business (utilizing the newest invention – IBM computers!) and a needlework company producing kits and plans of my designs. During the middle seventies, I was fortunate to be the Staff Graphic Artist at Mystic Seaport, which allowed me to be very creative with my graphic arts experience, as well as my English degree. I designed the first Mystic Seaport Poster (still a big seller) and designed many publications and books. I still love “graphic arts” and keep my hand in by doing some pro bono work for organizations I belong to, and more recently I am using the Internet as a resource with several websites I’ve designed. During the mid seventies I resumed my interest in painting. I exhibited frequently in Southeastern Connecticut and had a solo show in Mystic. I later decided to return to school. First at the National Academy of Design, in New York, taking painting classes with Mary Beth McKenzie and drawing with James Childs. Later that year I continued studying at Lyme Academy of Fine Arts in Old Lyme, Connecticut studying drawing and anatomy with Dean Keller. I was extremely fortunate to be able to take several workshops with Aaron Shikler during those years. During the late eighties I “discovered” sculpture and studied again at Lyme Academy with Laci deGerenday. Learning sculpture has changed the way I look at things. In the early nineties I was introduced to Monotype printmaking and felt that my graphic arts background had become interlaced with my painting when I experimented with this technique and fell in love it. I joined the Monotype Guild of New England and served on the Board of Directors of that organization. I designed and maintained their website and was voted an honorary member in 2003. In the early 1990s I moved my studio to Westerly, Rhode Island, where I became active in the fledgling Artists’ Cooperative Gallery and the bare beginnings of the Westerly Arts Community, where I could participate in the Arts Network. An artist friend, Sandi Gold, and I acquired a gallery, and In the winter of 1999 we increased our space to include a classroom where we both taught painting. 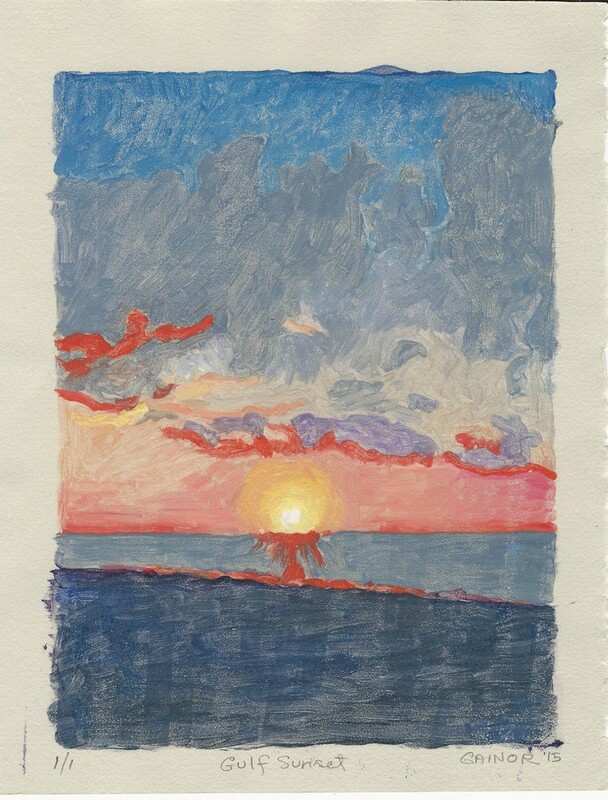 During the fall and winter of 2001/2002 I started to experiment with egg tempera. The methods and materials of the Medieval and early Renaissance painters totally fascinates me. After reading about the technique for years I finally decided to try making gesso panels and grind my own pigments. My early attempts were very exciting, and I continue to discover and learn new techniques and crave every new earth color I read about. After moving to Florida I became affiliated with the Horizon Line Gallery in Temple Terrace and had a solo show there in 2003 and in 2005 I had a 50-year Retrospective of my work. I taught classes and workshops there until the gallery closed in 2008. Carrollwood Cultural Center opened shortly after that and I teach painting, drawing, watercolor, and a variety of computer classes including Digital Photography in that splendid facility, and I participate in many art shows that are put on by local art groups. I was honored to be asked to have a solo show at The George Waters Gallery, Elmira College which opened during Alumni weekend, June 2008. The show stayed in place for the remainder of the summer. I call myself a realist painter, interested in traditional methods and materials, while drawing inspiration from many periods and styles in art. I enjoy the mechanics of drawing and I am in love with color. I am a member of North Tampa Arts League, TESA (The Exhibiting Society of Artists), The Egg Tempera Society, and and I am an honorary member of the New England Monotype Guild. In 2007 I was elected to the National League of American Pen Women as an artist member, and 2017 I was awarded a letters membership as well. My work may be seen on many websites and art venues on the Internet and I am honored to be in many private collections throughout the United States and abroad.